Boston missed almost half its free throws in the first half and committed seven turnovers in the third quarter, but never let up defensively in a 94-86 win over the Warriors on Friday night. BOSTON (AP) — The Celtics cooled off Stephen Curry early, then shut down the rest of Golden State’s lineup in the second half well enough to overcome their own mistakes. Curry still led Golden State with 25 points, but that was less than half his total from two nights before when he scored 54 at Madison Square Garden in New York. “I told our guys, ‘If Steph has 54 and we win, I’m taking that. We have to guard everyone else,'” Celtics coach Doc Rivers said. The pressure defense cost the Celtics their starting backcourt for much of the second half when guards Avery Bradley and Courtney Lee got into foul trouble, but they had already accomplished their mission by getting Curry out of sync early. Curry made all 10 of his free throws, but just two in the second half when the Celtics stopped giving him frequent trips to the line and gradually opened a 13-point lead that was too much for the road-weary Warriors to overcome. Paul Pierce led Boston with 26 points, Jeff Green scored 14 of his 18 in the second half and Kevin Garnett pulled down 13 rebounds in the Celtics’ eighth straight home win. Although Bradley and Lee finished with eight points apiece and combined for nine fouls, their defensive contributions were recognized by their teammates. “Our guards, they were ready for tonight’s challenge. Avery set the tone very early,” Garnett said. Curry finished 6 of 22 from the field as Golden State shot 34 percent (32 for 94). The Warriors were just 16 for 53 (30 percent) in the second half with Curry going 3 for 13, including one 3-point attempt that missed everything and drew taunts of “air-ball!” from Boston fans. Curry didn’t come close to the jaw-dropping shooting performance that led to his career high for scoring Wednesday night. He was 18 of 28 from the field against the Knicks, including 11 for 13 on 3-pointers, but struggled Friday from everywhere other than the foul line. David Lee had 10 points and 19 rebounds in his return from a one-game suspension for the Warriors, who outrebounded the Celtics 54-44. Harrison Barnes scored 16 and Klay Thompson added 15 for Golden State, which fell to 1-3 on a five-game road trip that concludes Saturday in Philadelphia. Golden State was able to keep it close most of the way by capitalizing on many Boston mistakes, including 9-of-16 free throw shooting in the first half. Bradley picked up his third foul with 1:05 left in the second quarter, then two more in the first 3:59 of the third period. He fouled Curry for his fifth personal with 8:01 to go in the third and was quickly called back to the bench before Curry made both his free throws to put Golden State up 54-53. Boston went to a zone defense that the Warriors were unable to penetrate. Boston committed seven turnovers in the third period, but finished it off on a 9-2 run and led 69-62 entering the final quarter. The Celtics scored nine straight before Carl Landry’s putback ended a scoring drought that lasted nearly 4 minutes. The Warriors went without a point from Landry’s jumper that tied the score at 60 with 3:55 left in the third until Landry put back an offensive rebound with 3 seconds left. Curry’s shooting woes continued in the fourth and he finished 3 for 11 on 3s. His airball in the fourth bounced right to the Celtics and led to Jordan Crawford’s fadeaway jumper that put Boston up 75-66. NOTES: The Celtics improved to 3-3 since the All-Star break. … The Warriors have lost eight of their last 10 in Boston. … Landry scored 11 points and five Golden State players finished in double figures. … Pierce and Green were the only Celtics players to score more than eight points. 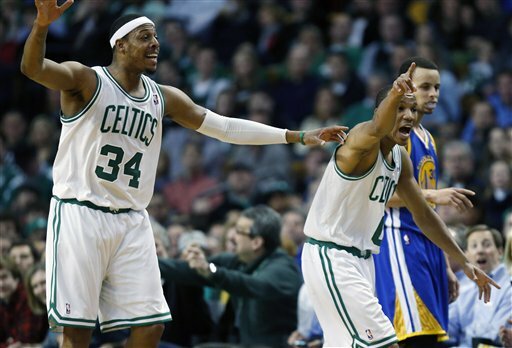 … Curry’s eight points from the foul line were just one fewer than the Celtics had altogether. … Pierce scored 18 in the first half, but the Celtics’ reserves combined for only eight points.